Displaying the lighthouse cake are, from left, Mayor Billy Barlow, Assemblyman Will Barclay and H. Lee White Maritime Director Mercedes Niess. OSWEGO, NY – It had all the elements of a perfect birthday party. There was a large crowd of friends, a rousing rendition of the Birthday Song, cake and other refreshments. 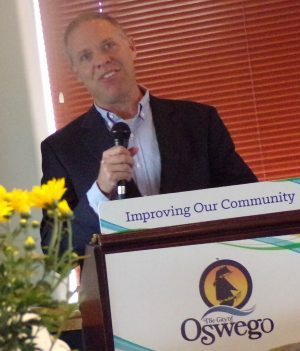 However, Oswego Mayor Billy Barlow hit the pause button on his birthday celebration on Tuesday to fete the Oswego West Pierhead Lighthouse instead. 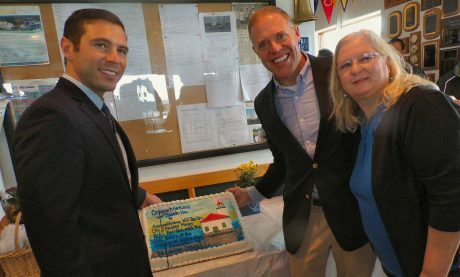 The Oswego Yacht Club building was jam-packed by city, county and state officials, historians, lighthouse committee volunteers and dozens more who just wanted to celebrate the on-going preservations efforts at the Oswego landmark. “We are honored and privileged to work on this lighthouse on behalf of our community and our region,” said H. Lee White Maritime Director Mercedes Niess. The lighthouse is iconic and a very special piece of the Port City’s history, the mayor agreed. He thanked Niess for taking a leadership role in the restoration project. He also recognized the Lighthouse Committee and all the volunteers who have donated their time and effort over the past few years. The city began working on the lighthouse in 2013; in 2014, the city officially leased the lighthouse to the Maritime Museum. 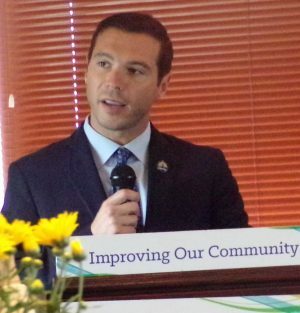 The momentum picked up when Assemblyman Barclay stepped in, the mayor pointed out. He witnessed first-hand the work that was being dome “and was inspired,” Barlow added. Eventually, the Assemblyman secured $100,000 for the project. In 2016, the city stepped up and won $1.1 million in grant funding. Of that, $75,000 was earmarked for the lighthouse project. A couple months ago, the city allocated an additional $50,000 Barlow continued. Funds were used for structural improvements, an exterior paint job, seal and paint the roof as well as other work, he said. “It’s great to be here and see such a great turnout,” Barclay told the large crowd. Assemblyman Will Barclay praises Mayor Barlow for his leadership. He also cited Mercedes Niess and the lighthouse committee for their hard work. When he looks at projects, he always looks to see what type of leadership there is and what type of volunteers there are, Barclay said. “I really hope we can preserve the lighthouse, keep up the good work,” Barlow said. On a lighter note, the Assemblyman reminded everyone that Barlow was the youngest mayor in the state. “But he’s moved up a little bit – today is his birthday! Happy 18th, Billy,” he quipped. What would OSWEGO do without Mercedes Niess, not just the H. Lee White Marine Museum, or the Lighthouse (now museum!)??? She can mobilize a substantial group of volunteers that BENEFITS the whole community. Extremely impressive results. The Lighthouse is the SYMBOL of Oswego, and now it finally has a bright happy face to welcome boaters to our community, as well as land-lubbers who can finally visit the rooms (being restored at a very very fast pace thanks to all those dedicated workers who give of their time and physical energies for the benefit of us all!). THANK YOU, MERC, STAFF, our Civic Leader, Mayor Barlow, and, of course, the dedicated VOLUNTEERS!